Last year we advised you to use ES2015 - however, a lot has changed since. Back then, Node.js v4 was the LTS version, and it had support for 57% of the ES2015 functionality. A year passed and ES2015 support grew to 99% with Node v6. If you are on the latest Node.js LTS version you don’t need babel anymore to use the whole feature set of ES2015. But even with this said, on the client side you’ll probably still need it! For more information on which Node.js version supports which ES2015 features, I’d recommend checking out node.green. Promises are a concurrency primitive, first described in the 80s. Now they are part of most modern programming languages to make your life easier. Of course, for now, the fs API does not have an readFileAsync that returns a Promise. To make it work, you have to wrap it with a module like promisifyAll. When it comes to code style, it is crucial to have a company-wide standard, so when you have to change projects, you can be productive starting from day zero, without having to worry about building the build because of different presets. With Standard, there is no decisions to make, no .eslintrc, .jshintrc, or .jscsrc files to manage. It just works. You can find the Standard rules here. You can think of Docker images as deployment artifacts - Docker containers wrap up a piece of software in a complete filesystem that contains everything it needs to run: code, runtime, system tools, system libraries – anything you can install on a server. But why should you start using Docker? and with them, you can mirror production environments locally. To get started with Docker, head over to the official getting started tutorial. Also, for orchestration we recommend checking out our Kubernetes best practices article. If something breaks in your Node.js application, you should be the first one to know about it, not your customers. One of the newer open-source solutions is Prometheus that can help you achieve this. Prometheus is an open-source systems monitoring and alerting toolkit originally built at SoundCloud. The only downside of Prometheus is that you have to set it up for you and host it for yourself. 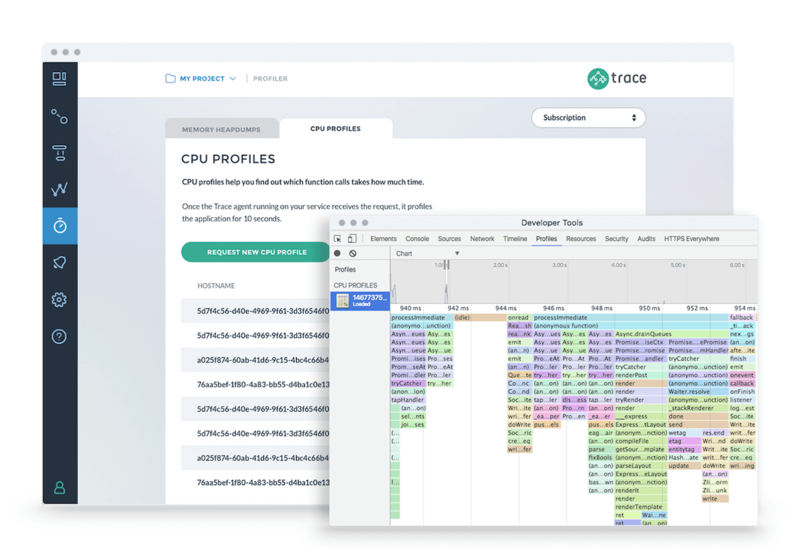 If you are looking for on out-of-the-box solution with support, Trace by RisingStack is a great solution developed by us. and keeping your npm packages secure! If you are using HTTP for sending messages, then whenever the receiving party is down, all your messages are lost. However, if you pick a persistent transport layer, like a message queue to send messages, you won’t have this problem. If the receiving service is down, the messages will be kept, and can be processed later. If the service is not down, but there is an issue, processing can be retried, so no data gets lost. An example: you’d like to send out thousands of emails. In this case, you would just have to put some basic information like the target email address and the first name, and a background worker could easily put together the email’s content and send them out. What’s really great about this approach is that you can scale it whenever you want, and no traffic will be lost. If you see that there are millions of emails to be sent out, you can add extra workers, and they can consume the very same queue. To get the best of the two worlds (stability and new features) we recommend using the latest LTS (long-term support) version of Node.js. As of writing this article, it is version 6.9.2. 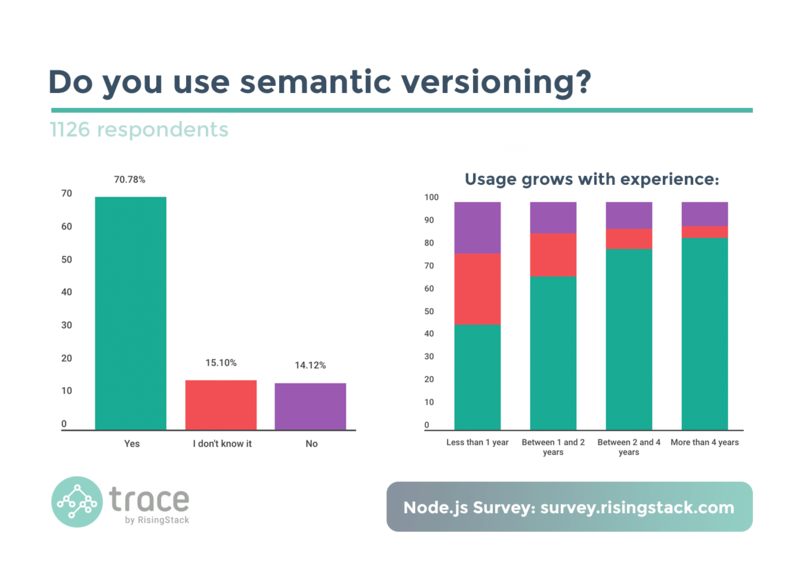 We conducted a Node.js Developer Survey a few months ago, which allowed us to get some insights on how people use semantic versioning. Unfortunately, we found out that only 71% of our respondents uses semantic versioning when publishing/consuming modules. This number should be higher in our opinion - everyone should use it! Why? Because updating packages without semver can easily break Node.js apps. Versioning your application / modules is critical - your consumers must know if a new version of a module is published and what needs to be done on their side to get the new version. npm also uses SemVer when installing your dependencies, so when you publish modules, always make sure to respect it. Otherwise, you can break others applications! Securing your users and customers data should be one of your top priorities in 2017. In 2016 alone, hundreds of millions of user accounts were compromised as a result of low security. After you’ve embraced the basics, check out my Node Interactive talk on Surviving Web Security with Node.js! Serverless started with the introduction of AWS Lambda. Since then it is growing fast, with a blooming open-source community. In the next years, serverless will become a major factor for building new applications. If you’d like to stay on the edge, you should start learning it today. One of the most popular solutions is the Serverless Framework, which helps in deploying AWS Lambda functions. Attending conferences and meetups are great ways to learn about new trends, use-cases or best practices. Also, it is a great forum to meet new people. To take it one step forward, I’d like to encourage you to speak at one of these events as well! As public speaking is tough, and “imagine everyone’s naked” is the worst advice, I’d recommend checking out speaking.io for tips on public speaking! As 2017 will be the year of Node.js, we’d like to help you getting the most out of it!